It can be surprising just how heavily lactose factors into our everyday food and drink. This is not a problem for the average person, but when you’re lactose intolerant, a trip to the grocery store usually requires a bit more planning, especially if you are newly diagnosed. Those who are lactose intolerant are unable fully to digest lactose, which is milk sugar. Lactose is commonly found in dairy products such as milk and ice cream, but it can also be in salad dressings, candy, and some breads. A lactose-intolerant person who consumes lactose may experience unpleasant symptoms such as gas, bloating, cramping, nausea and diarrhea. *It’s important that you speak with your gastroenterologist in order to determine if you are in need of a completely lactose-free diet or if you can alternate in a few low-lactose items every so often. Craving ice cream? Try sherbet or a sorbet instead. Sherbet is not completely lactose-free, but it is low-lactose. If you are able to enjoy a low-lactose food from time to time without triggering your symptoms, then sherbet is a nice alternative to ice cream, which is high in lactose. Sorbet is a dairy-free food and a favorite of many lactose intolerants. Both sherbet and sorbet should be consumed in moderation. Even with low or no lactose, they still contain sugar which can upset a person’s stomach and lead to weight gain and other health issues if consumed in large amounts. Yogurt is actually an option. Yogurt may be a surprising option for those who cannot tolerate lactose, but it is technically a low-lactose food item. 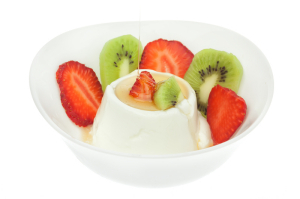 Yogurt contains healthy “good” bacteria known as probiotics that help your digestive system function well. Regular milk that contains lactose is an obvious “no-go” for those who are lactose intolerant, but there are other beverages that are advertised as alternative “milk” that your digestive system will be able to digest without causing painful, unpleasant symptoms. These include: soy milk, rice milk, almond milk, hemp milk and coconut milk. Being lactose intolerant doesn’t mean you have to give up all of your favorite go-to’s at the grocery store. You’ll just need to work out how much lactose your body can digest without upsetting your system and which food and drink items work best in your diet. Be sure to also check out some of the best practices for living a lactose intolerant lifestyle.